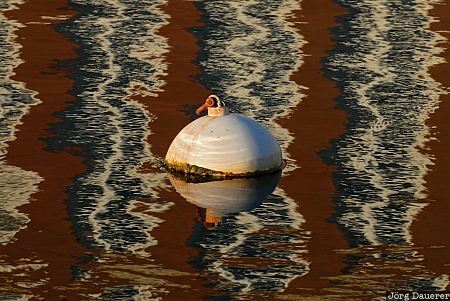 A lone white buoy surrounded by the interesting pattern created by the reflexion of a red brick building in Eel Pond in Woods Hole in the early morning. Woods Hole is on Cape Cod at the Atlantic coast of Massachusetts, United States. This photo was taken in the morning of a sunny day in May of 2010. This photo was the image of the month in May of 2011. This photo was taken with a digital camera.